My family had a most enjoyable time during our day trips with Toshio.He is knowledgeable of the various areas we visited and ahelped make the entire visit fun and interesting. We liked the flexibility of a customized itinerary which Toshio helped to put together. I only had to share what we wanted to see and he suggested the places and coordinated the timing and plans. 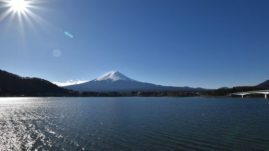 We did 2 separate day trips to areas around Mount Fuji and Toshio brought us to various spots like KachiKachi ropeway, Fujikyu Highland/ Thomas Land, Ideboku farm, Yeti Snow Resort and Gotemba Premium Outlets (something for everyone in our group). Toshio is a good driver and ensured our journey was smooth and comfortable. This was especially important as we were travelling with 2 young kids and 2 seniors. The kids and my parents were all very happy. We thoroughly enjoyed our trip with Toshio. Thank you Toshio-san for making our trip to Tokyo wonderful. See you when we are next in Tokyo again.